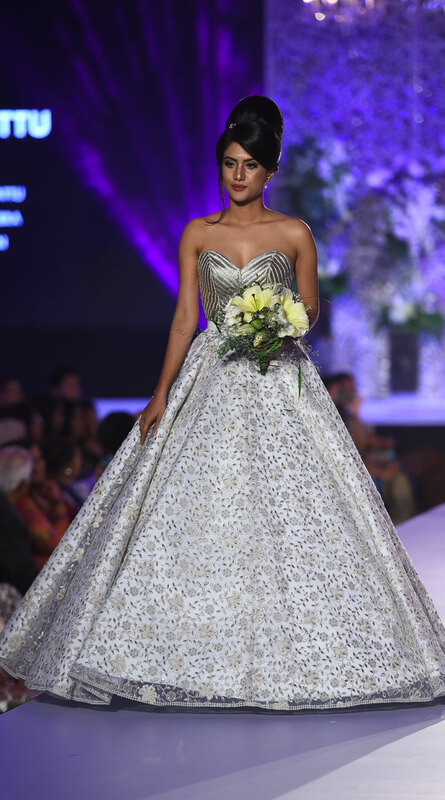 The latest trends and best quality fabrics came to life in a cornucopia of bridal ensembles presented by a host of Sri Lanka's leading bridal designers and hair and makeup artists. 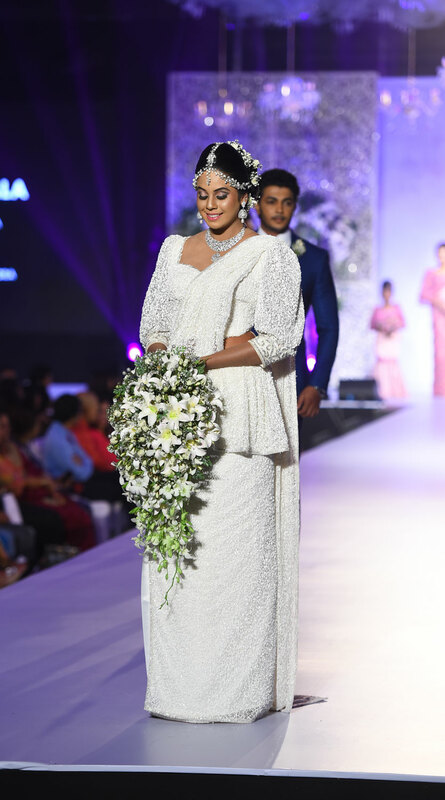 The Designer Wedding show hosted by the Bride and Groom magazine held at the Shangri-La hotel in Colombo was a glamorous affair with many of Colombo’s leading personnel from the bridal industry attending to catch of glimpse of a preview of looks for 2018. 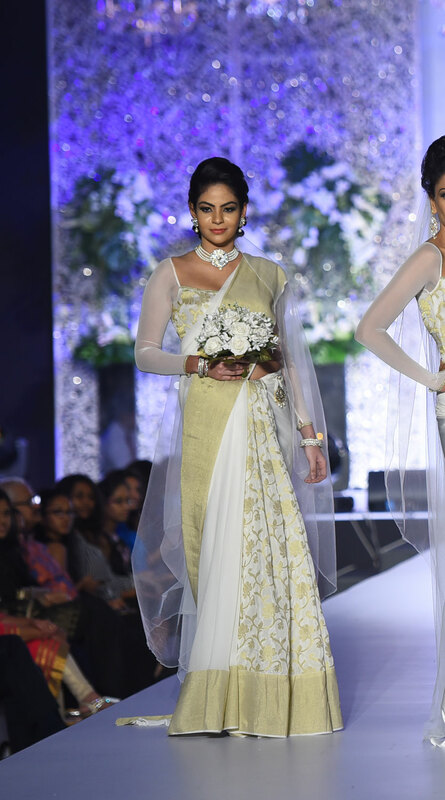 Glamorous saris and wedding dresses from mermaid style dresses to figure-hugging bodycon dresses in all their shapes and styles designed for the most modern and trendy brides were sent down the runway. 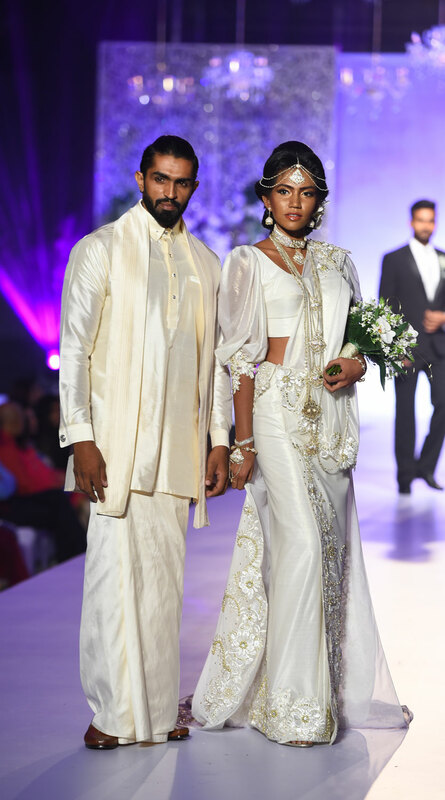 Ramani Fernando & Aslam Hussein were the strongest duos of the night. 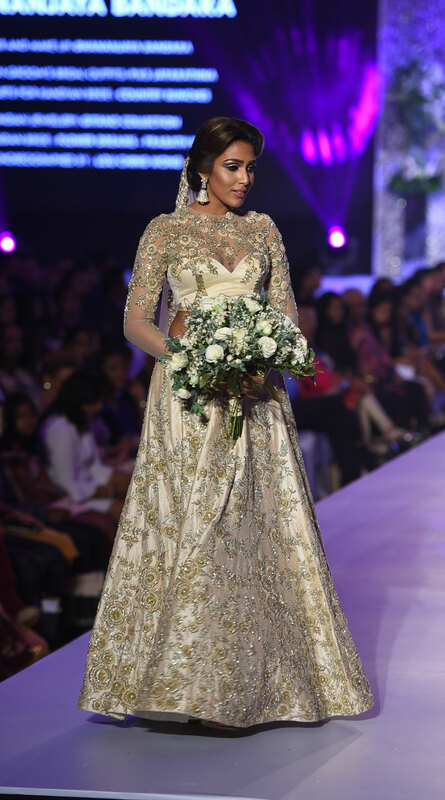 Aslam's designs and Ramani's makeup were a match made in bridal heaven. 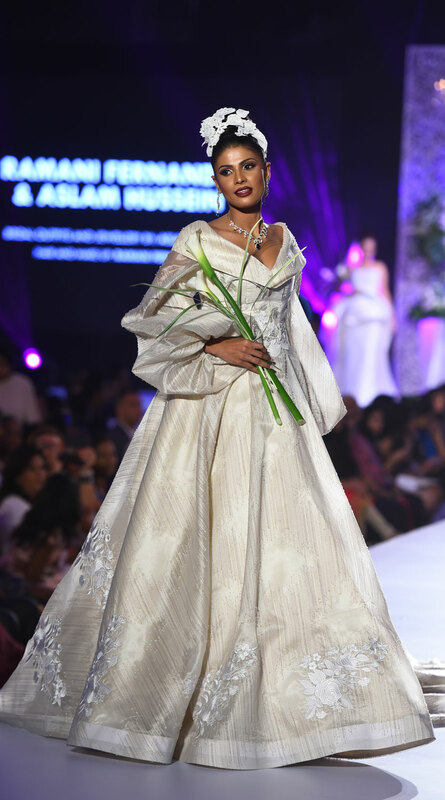 The collection by Aslam was a direct translation of elegance. 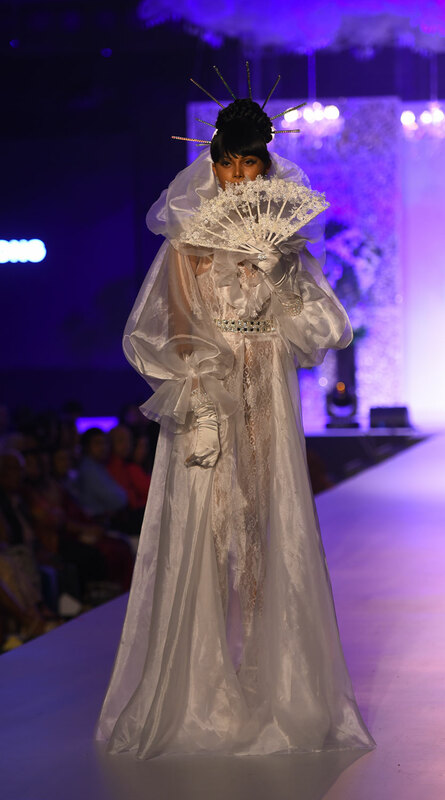 With minimalist veils, sculpted waists and balloon sleeves, this collection was reminiscent of a bygone era. 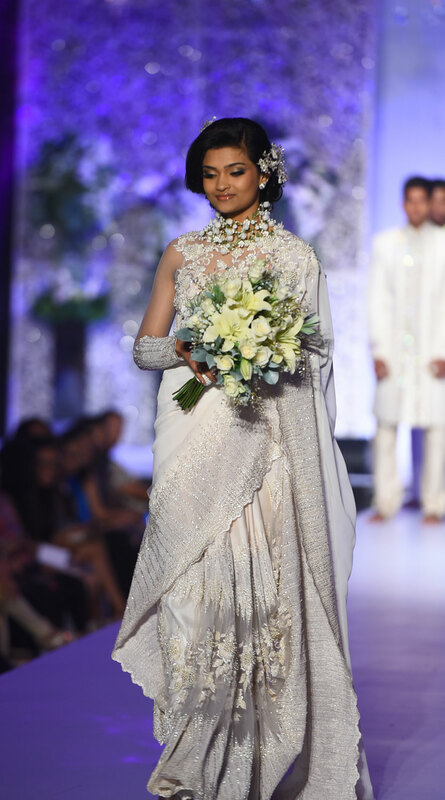 Ramani's makeup was an equally elegant affair that set a perfect example for bridal makeup. 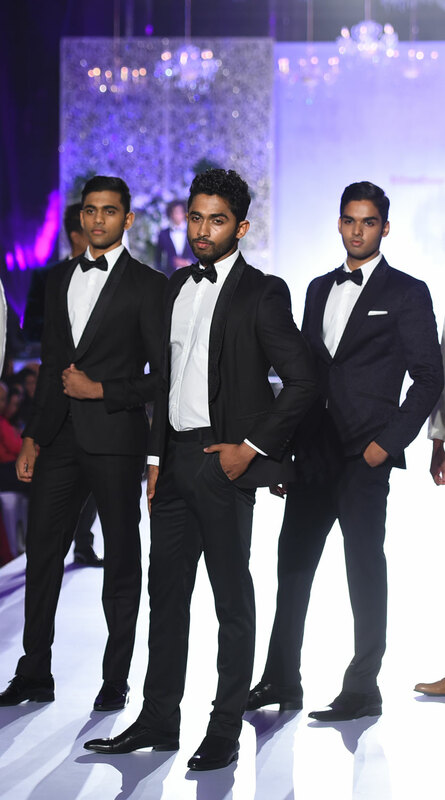 Aslam also presented a collection of groom's attire which was on point. 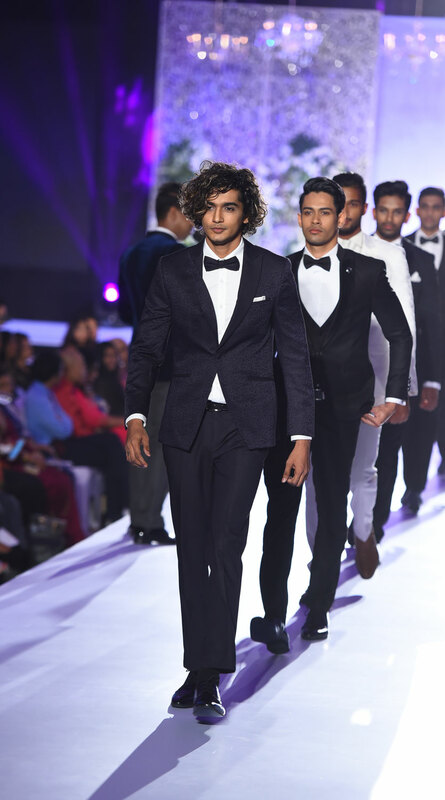 Fouzul Hameed of Hameedias presented a youthful collection of men's suits that had alternate patterns of textured lapels and suit bodies. 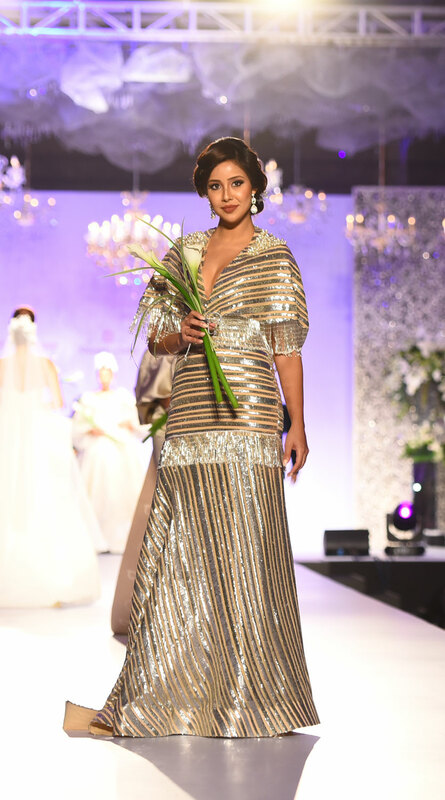 The subtly textured materials were the highlight of Hameedias collection. 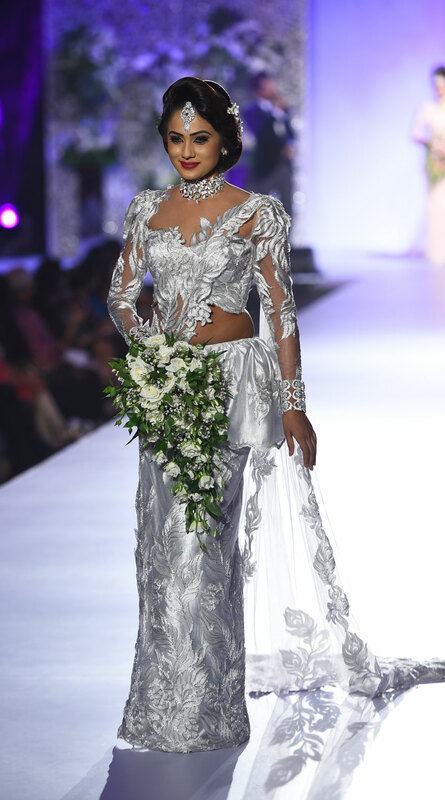 Michael Wijesuriya’s creations are structured and drenched in embellishments offering a visual feast. 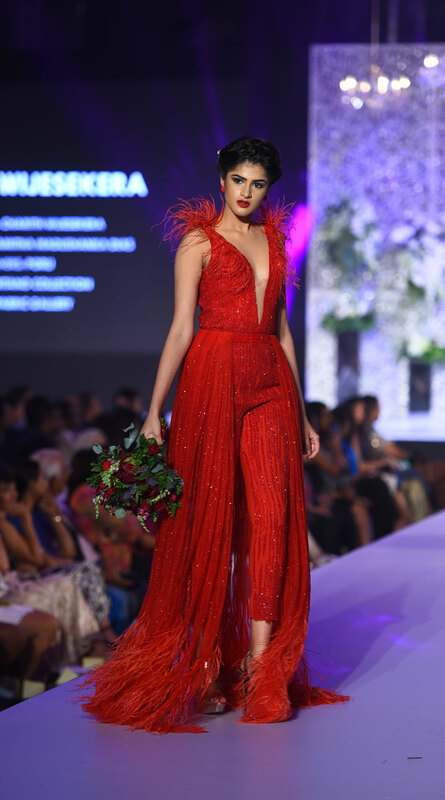 Perfect for someone looking for bedazzling evening wear, his collection stood out because he had incorporated patterned textile with plain to create dramatic, flowing looks on the runway. 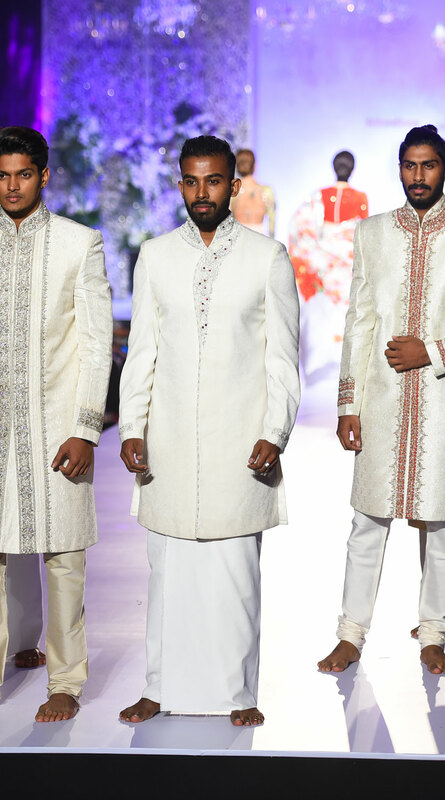 His grooms' collectionww all sherwanis in various hues of champagne and ivories with delicate embellishments to add a bit of va va voom. 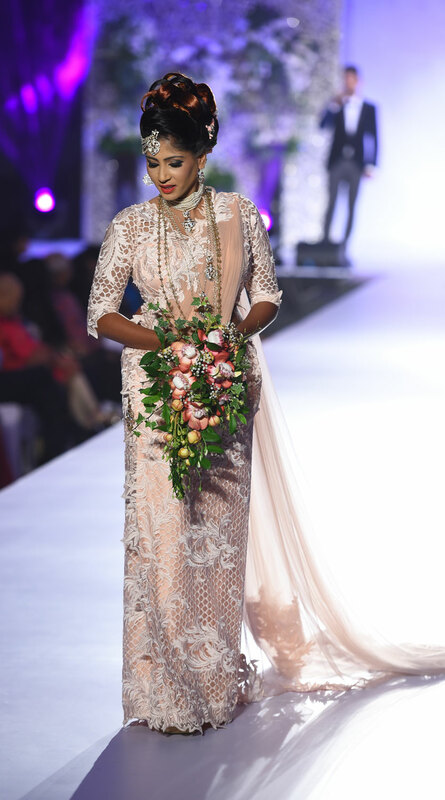 Yoland Aluwihare kept true to her signature style and infused delicate colours into her bridal creations. 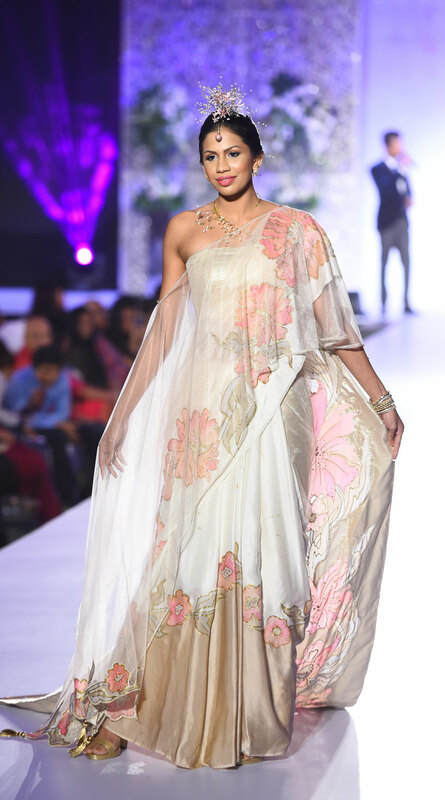 Following a floral theme, and painted flowers were glammed up with crystals and gold blouses. 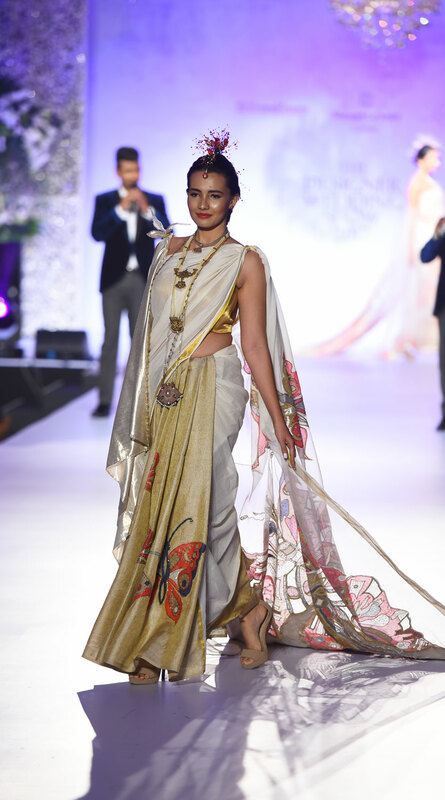 Her butterfly inspired sari with its embellished fall did not fail to turn heads. It reflected a look that was fit for one of our historical queens. 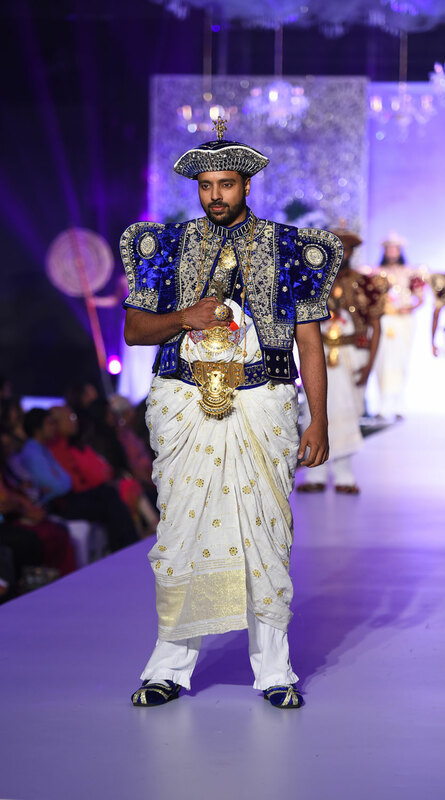 Dr. Premshri Hewawasam presented a collection of Kandyan sarees using a variety of fabrics. 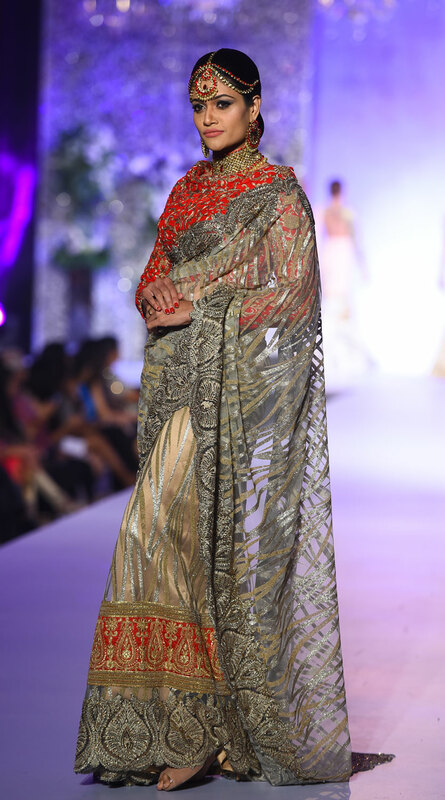 Being centred on various styles of lace, his showstopper was a brick red saree in guipure lace and crepe de chine. 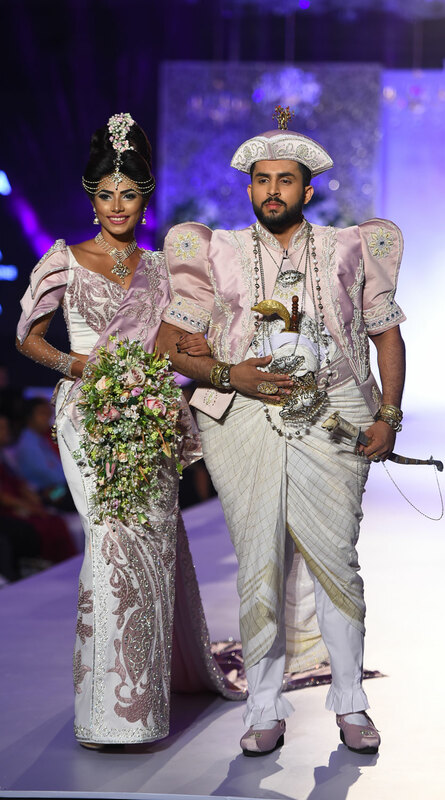 His collection is perfect for the bride looking for flamboyant attire. 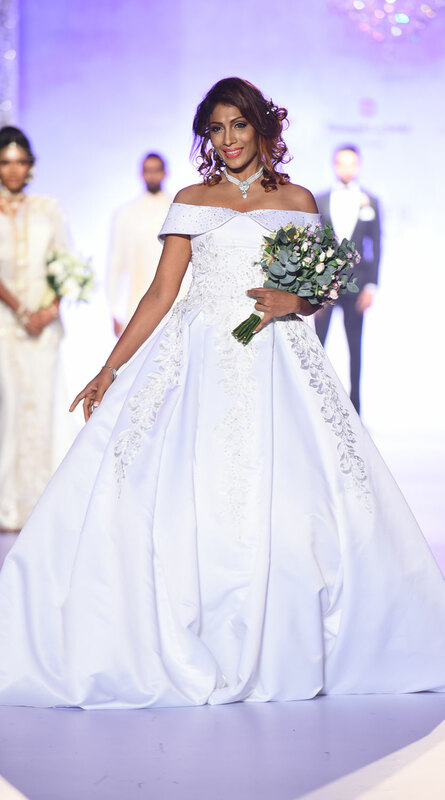 Cheryl Goonerate, a veteran in hair and makeup artistry showcased her hair and makeup prowess with clothing created by Michael Wijesuriya. Her makeup looks reflected the raw silk clothing with simplicity and subtle highlights along with a few dramatic hairstyles for effect. Her beehive look was stunning. 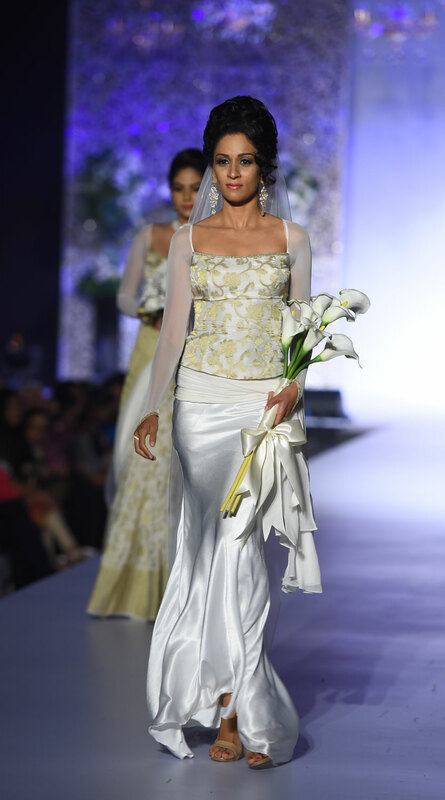 Dhananjaya Bandara is fast emerging as a designer of repute. 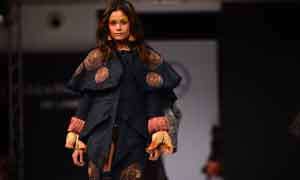 His collection contained a mix of sarees and stuck to traditional looks. His interpretation of the modern Kandyan was interesting with the fall of the pota tapering to a narrow end with three crystal orbs at the end of the fall. 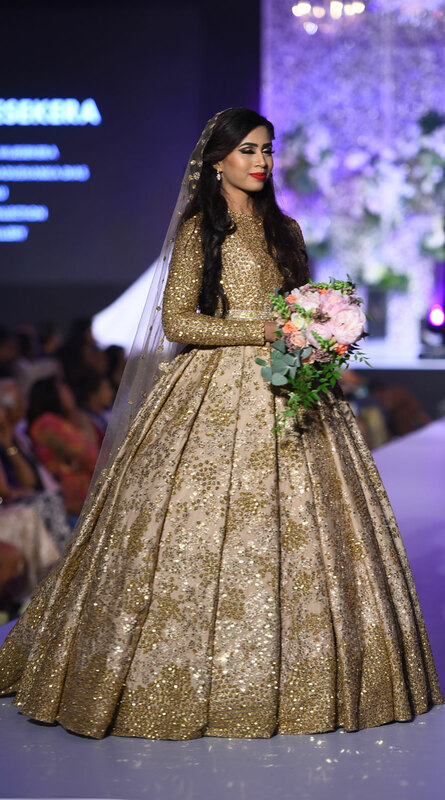 He also had a lehnga in bridal lace which was heavily embellished with crystals while the blouse was a striking piece of net and lace entwined complemented with heavy embellishments. Sarita Textorium renowned for their fabulous textiles and bridal sarees presented a comprehensive collection of sarees which ranged from simple toblingtastic. 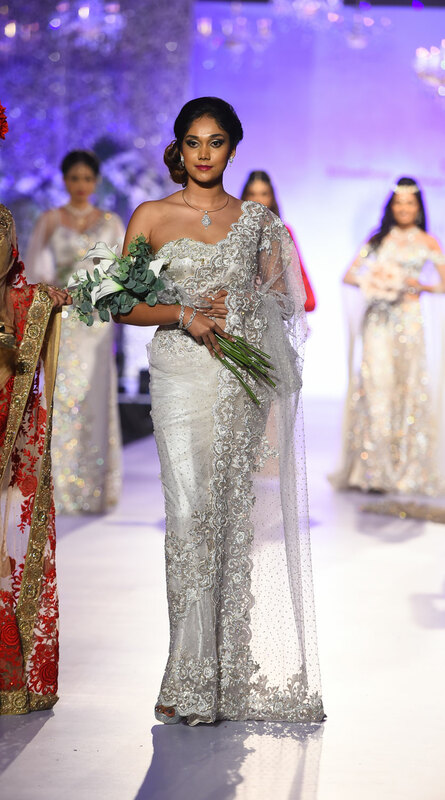 Sarita will not fail to be a bridal favourite! 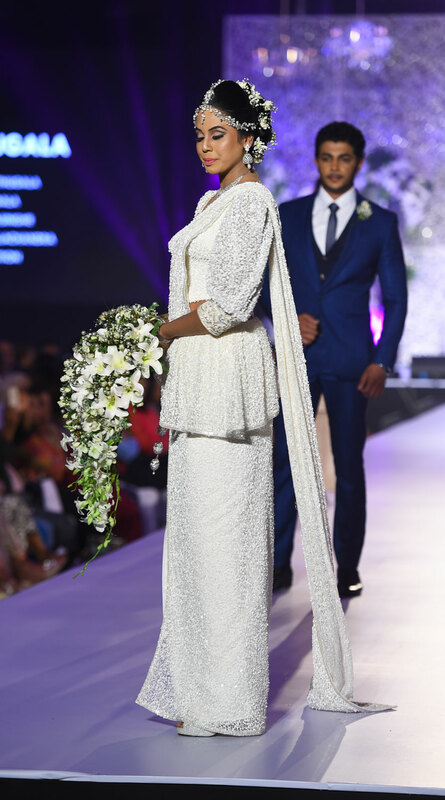 Ramzi Rahaman a veteran in the industry showcased his collection which included clothing for a poruwa, going away and homecoming- an all in one package. 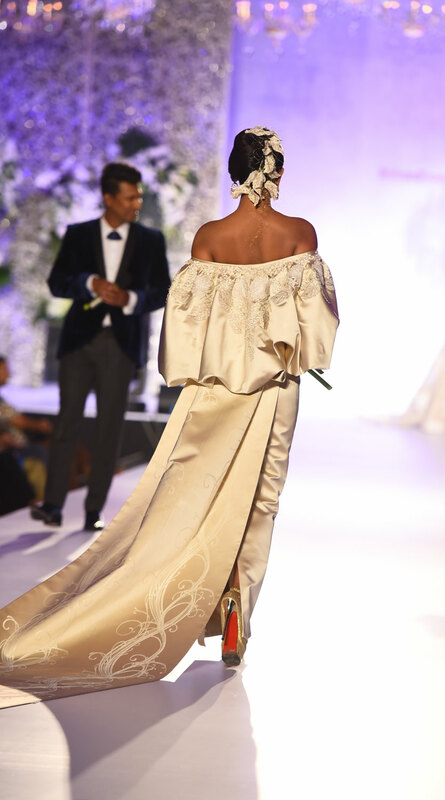 The bridal dress he presented was an archetypical full flared bridal dress with an off-shoulder detail. His hair and makeup looks were elegant. We did like his sixties inspired hair and veil. 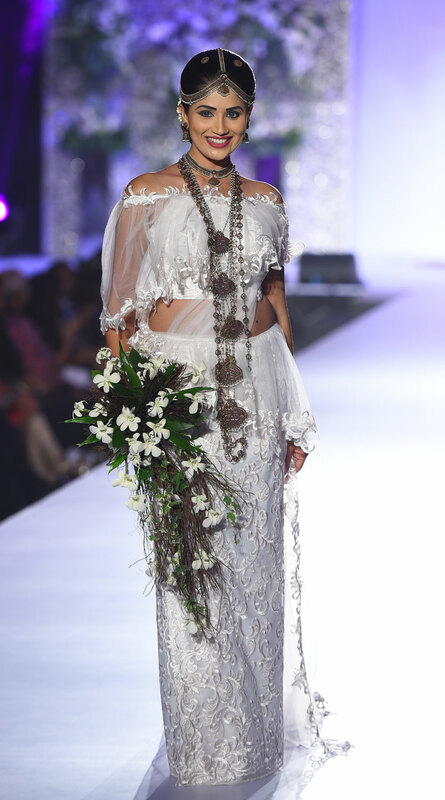 His poruwa piece was a particularly striking design that reminded us of his most striking creations done on his brides. 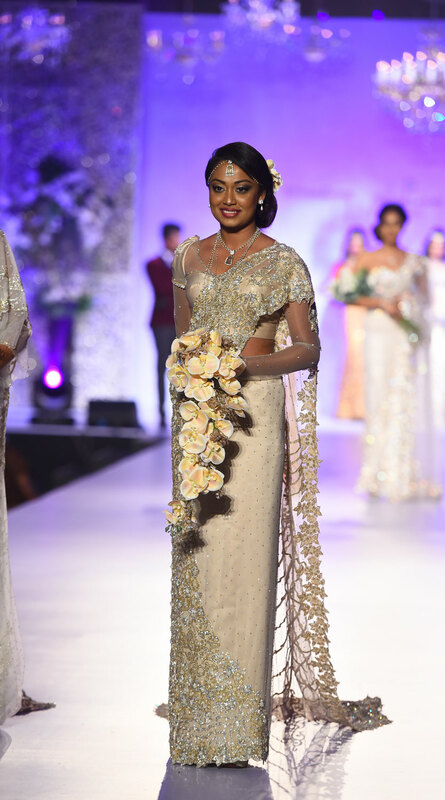 Thusitha Ethugala presented a varied collection of hair and makeup looks along with floral bouquets and headdresses. 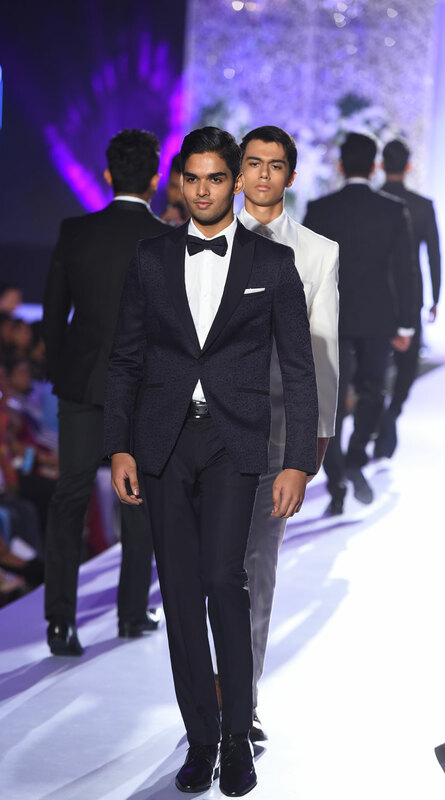 He also sent bridesmaids and flower girls down the ramp who were dressed elegantly. His makeup and hairstyles were in keeping with the theme. 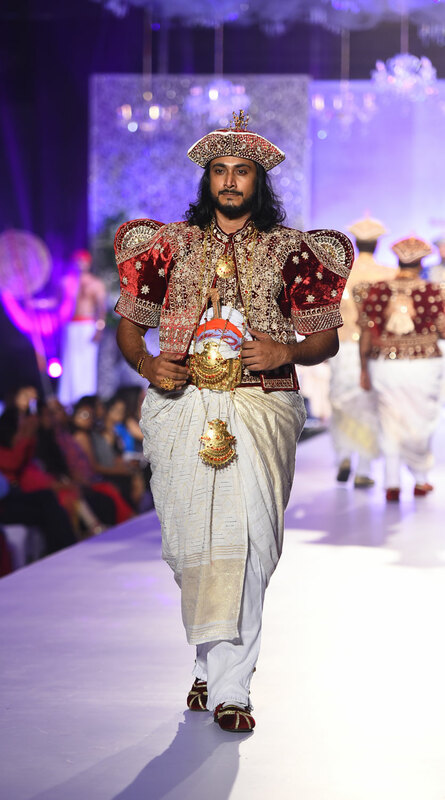 PVS Jayarathna is one of the leading creators of MulAndhum, Kandyan outfits for men. 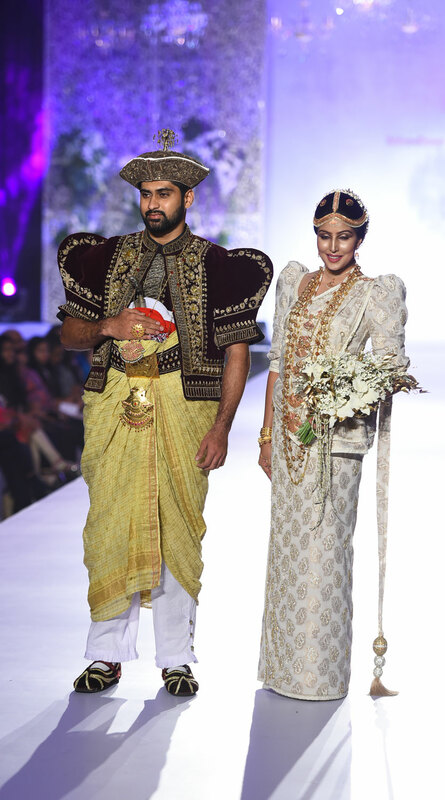 Customary and traditional, the outfits were in keeping with the Kandyan heritage. 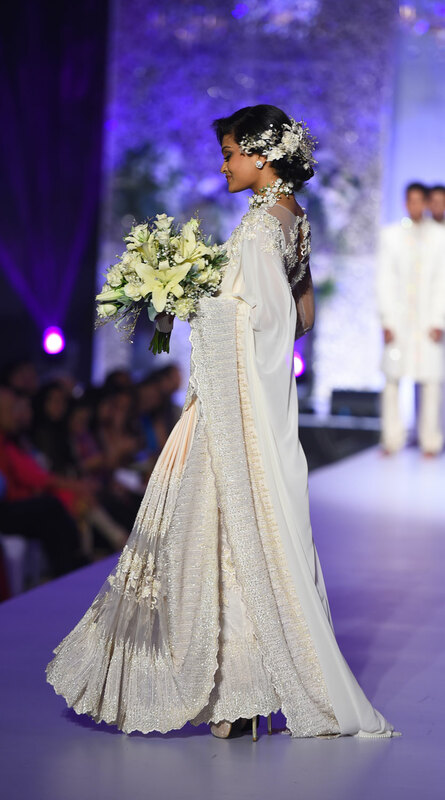 Embroidered swans and flowers, traditional blues, golds, and maroons were paraded on the stage ever so regally. 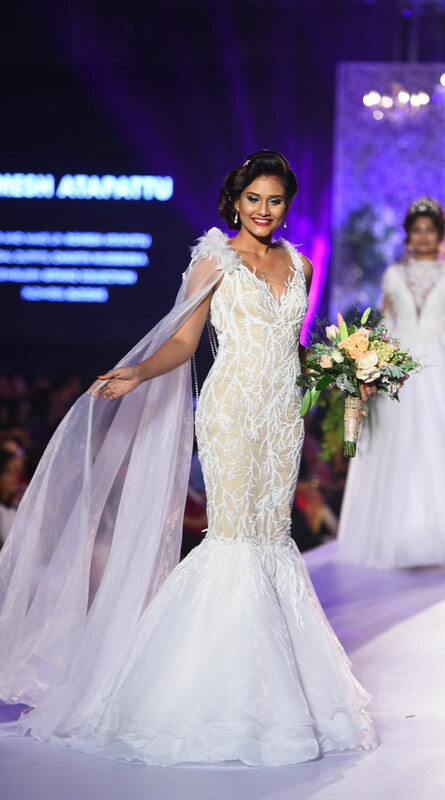 Nayana Karunaratne is a doyenne in the bridal dressing industry. 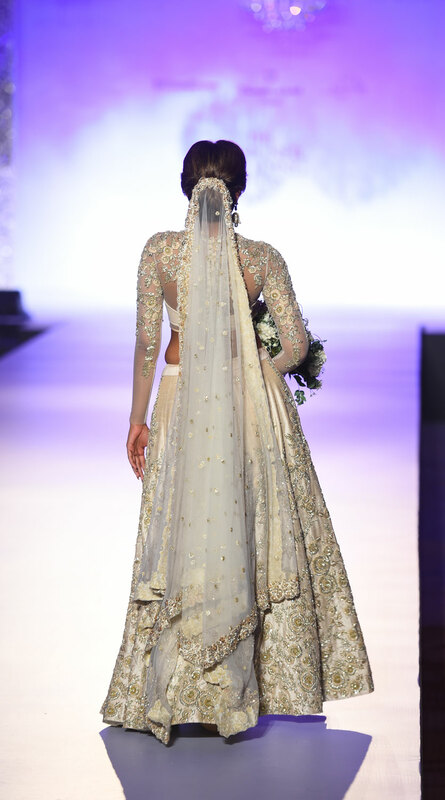 She used a range of fabrics and her looks were a saree, lehnga, and a dress, which were all simplicity personified. 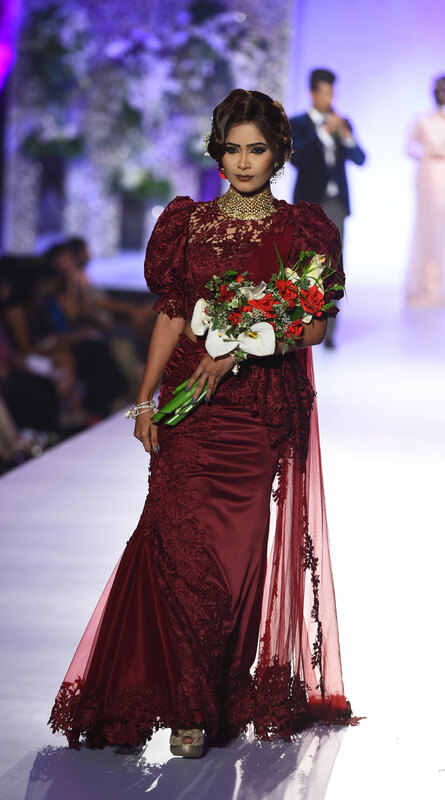 She made use of a particular material in all three of the designs that gave off an ethnic princess vibe. Her use of soft romantic materials like satins and nets was indeed a smart move. 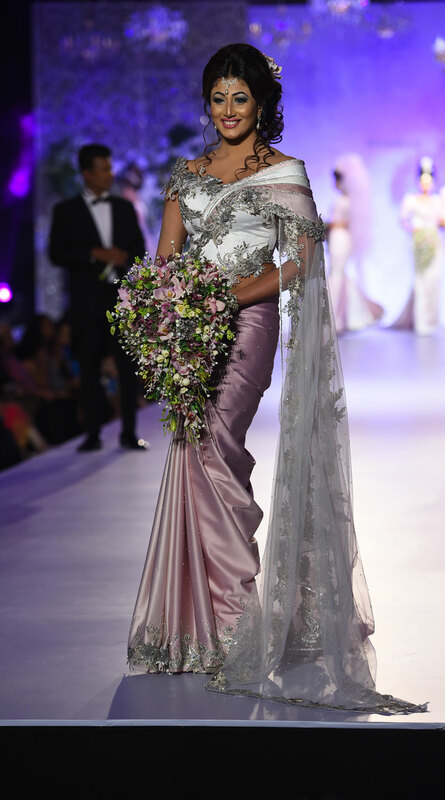 Sumudu Wasantha sent a collection of extravagant outfits in lavenders, mauves, and whites. 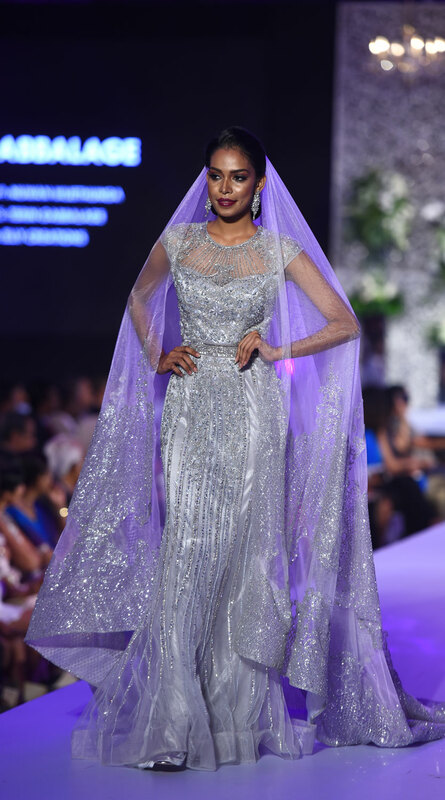 A mermaid skirt coupled with a bustier with puffed sleeves topped finished by a voluminous pink veil was one the show-stopping outfits he presented. The silver embellishments that were common to all outfits were what elevated his entire collection. 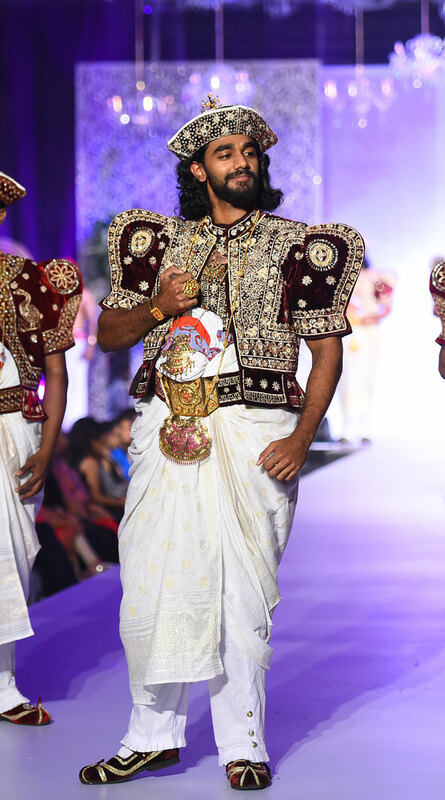 Romesh Atapattu showcased his hair and makeup artistry which he had perfected to a tee. He portrayed a signature look with a brown-red lip on all models. 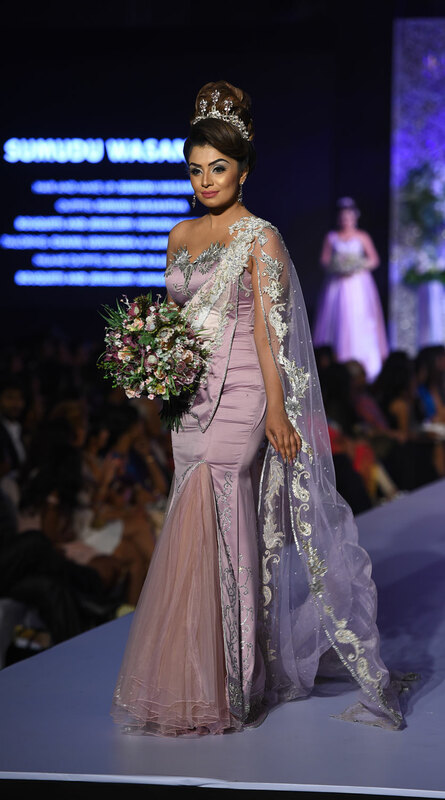 The brilliant makeup looks complemented the dresses created by Charith Wijesekera. 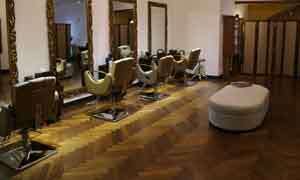 His hairstyles were up-dos which were smoothly executed as well. 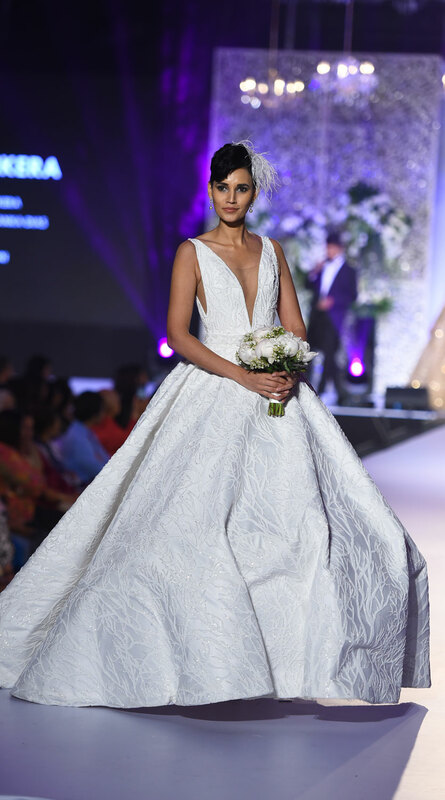 Charith Wijesekera’s collection highlighted his penchant for the full-skirted bridal. 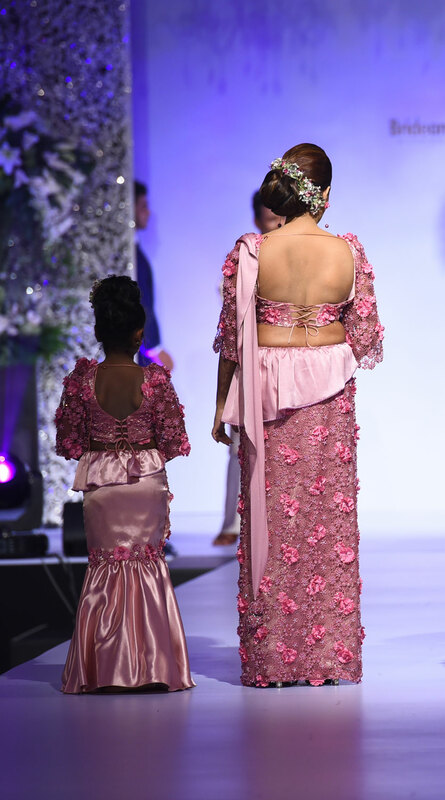 Huge flared dresses were sent down the runway. His particularly striking piece was his scarlet jumpsuit perfect for the scarlet woman about to walk down theisle for the umpteenth time perhaps. 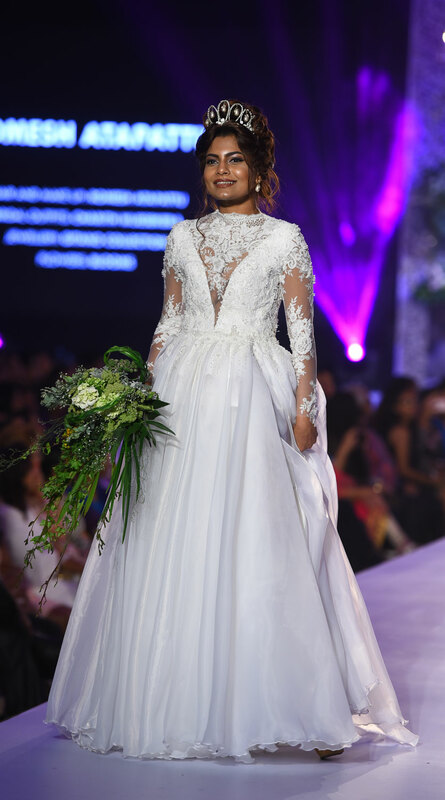 None the less, Charith’s collection was a memorable one that indeed rose to the top of the guest’s bridal lists. Lou Ching Wong in keeping with his dramatic persona presented a singular outfit which encapsulated the man himself. 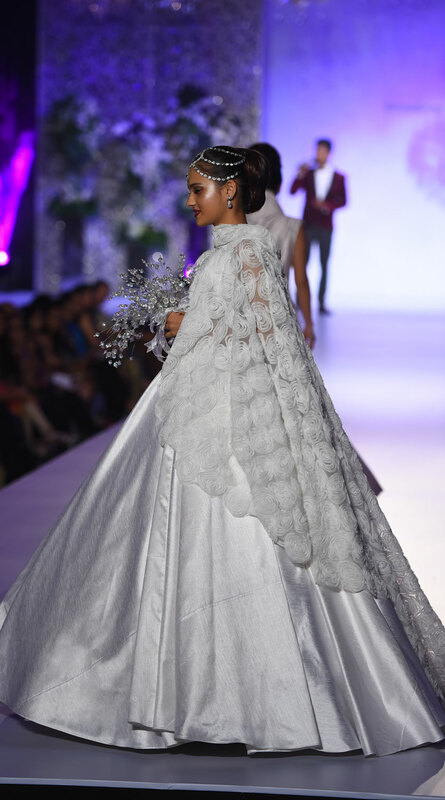 Defying rules, he presented a bride in a body suit with his take on an Elizabethan ruffle and a dramatic cape with billowing sleeves. 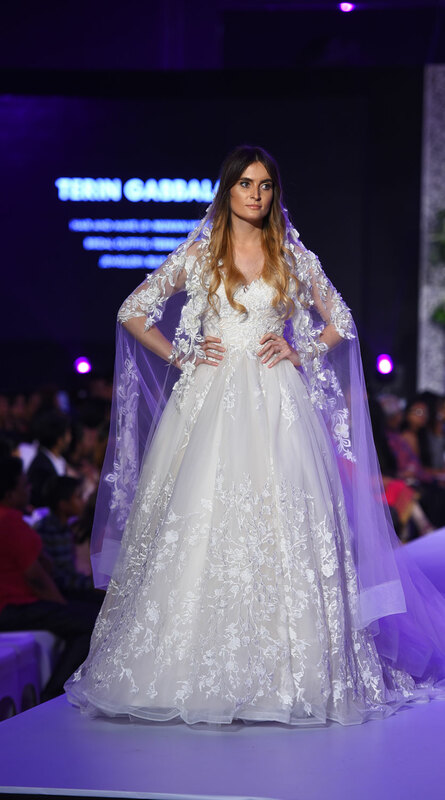 Terin Gabbalage’s collection of a trio of bridal dresses was reminiscent of a fairy tale. The veils particularly were fantastic. 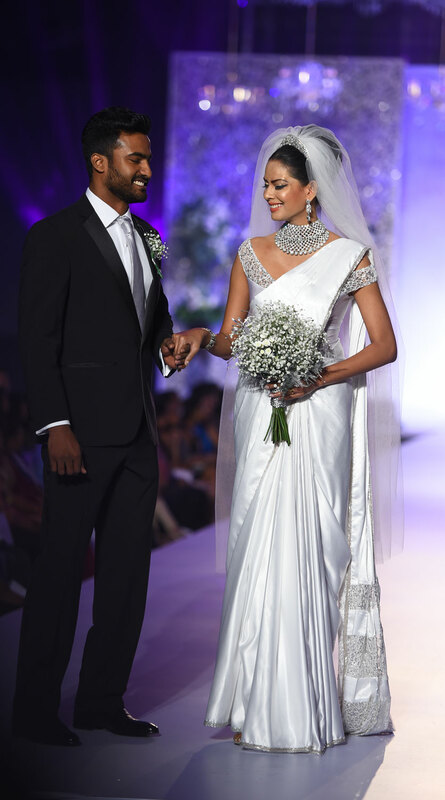 Hair and makeuplooks created by Nuwan Wijethunga were subtle, adding perfection to this collection. Terin didn't fail at marking her collection one of the most romantic that we saw that night. 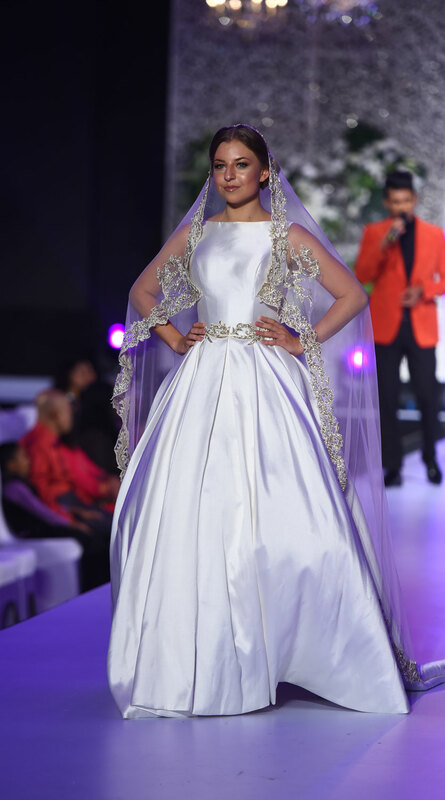 A noteworthy piece was the bridal satin, princess cut dress paired with the most delicate veil to complete the look. Amante showcased a range of lingerie which is sure to set pulses racing. 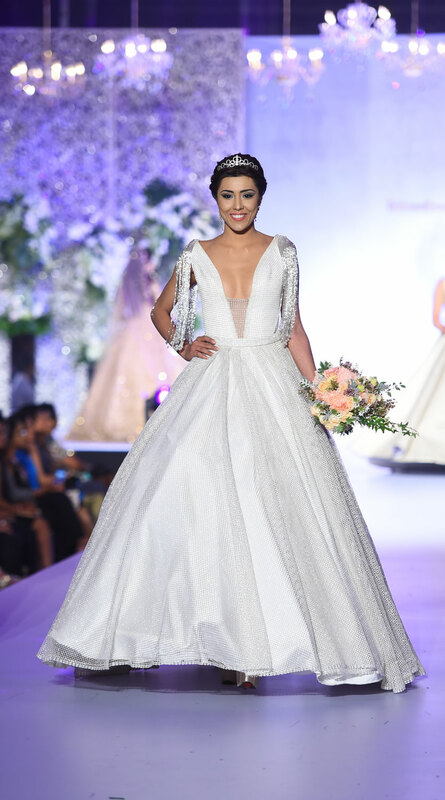 They ensured a diversified collection for the bride-to-be, the married and anyone who desires to feel like their best selves. This is revolutionary stuff. Each participant has made a fashion statement of sort. My take: a few of them deserve to feature on Vogue cover!